Contact owner for rates and availability (305-431-2006). Relax in Islamorada, Florida Keys... 'Sport Fishing Capital of the World.' Enjoy deep blue water or back country fishing. Dive, snorkel, and swim on a clear, white, sandy beach (rare in the Keys!). Walk/jog among beautiful waterfront homes. Sip wine while gazing at glorious sunsets while surrounded by coconut palms. Manatees, tarpon, mangrove snappers, and other native fish species swim the waters off our dock. Beautiful tropical vegetation, shore birds, and other marine life are all around you. You will cherish the memories of your stay in this 'Island Paradise.' Islamorada is known as 'The Purple Isle' and is located in the heart of the Florida Keys - midway between bustling Miami and laid-back Key West. This charming island home on a deep-water canal features high-beamed ceilings and a 'loft.' The walk-around deck, open floor plan, and kitchen designed for entertaining make this home an excellent choice for a carefree vacation. The home is newly furnished and redecorated and has two spacious bedrooms each with a private bath. The home is equipped with High Speed Wireless Internet Access. The home's 70-foot boat dock gives easy bay and ocean access and the private beach is a few steps away with your own private access. Great house for a fun family week in the Keys! My family of 5 comfortably stayed here for a week. We loved the location. 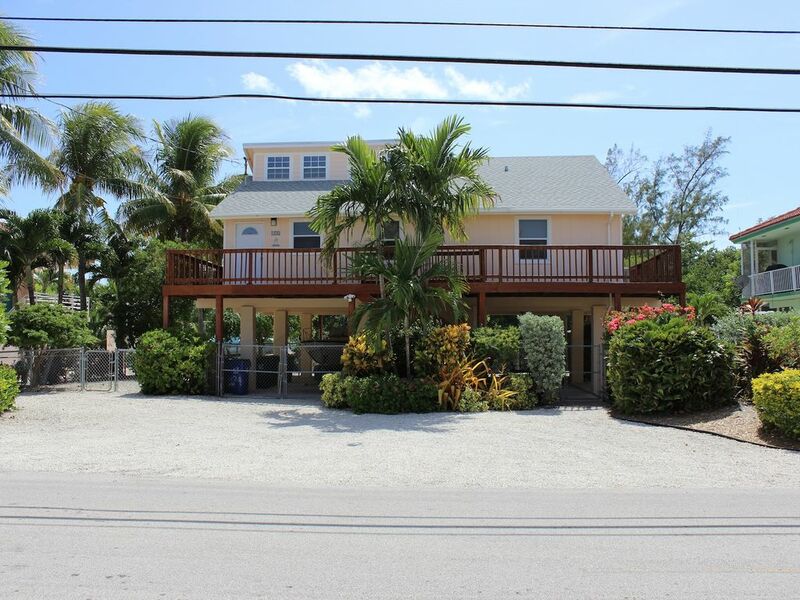 The house is just a quick drive to Robbies, and fairly central in the keys. The house was very clean and had everything we needed for the week. We would rent it again if and when we come back! We had a great stay at White Marlin Beach House. The house is very nicely equipped for most everything you'll need. Clean and comfortable. Within walking distance to a fresh seafood market. The beach was nice and only a short distance from the house. Would recommend to anyone looking in this area. Lovely Islamorada Canal View- Pretty and Comfortable! This is a lovely, comfortable place with convenient access to a beautiful beach. We kayaked from the beach, rode bikes up to one of the state parks (a little scary on a share the road bike lane on one of the bridges) and launched our boat from Founder's Park and were able to keep it on the dock. (It was a 26' and there was plenty of room to maneuver). We planned to bring two boats and cancelled one and by a fluke ended up with two boats parked in the front yard right before we left town but there was plenty of room there, too. Everything was well thought out. We enjoyed cooking dinner on the Weber Kettle. Thank you for a memorable vacation! Very clean and comfortable. Will stay here again when we find the time to get away. Great house, great location and the owner was very accommodating. Canal in the back of the house right out to the gulf made things very easy! The house was really nice & clean.beautiful private beach nearby.house had everything we needed. Christmas, New Years, Thanksgiving, Mini-Lobster & Other Major Holiday Weeks $300.00 per Week Extra Charge. Rental Rate and Fees are subject to change.